Hawksworth Restaurant is pleased to announce the appointment of its new Chef de Cuisine, Quinton Bennett. Bennett’s incredible international resume features some of the world’s most well-renowned restaurants such as England’s Michelin-starred Northcote Restaurant and Copenhagen’s Noma. Chef Bennett realized his passion for the culinary field at a young age, having been brought up surrounded by food in South Africa. Since then, he has travelled the world pursuing his career as a chef, working under some of the world’s most recognized culinary leaders. He shadowed Rudi Liebenberg at Picalomonde for two and a half years in Johannesburg, before moving onward to London, England to hone his technique amongst the world’s best. There, he was taken under the wing of Roux Scholarship winner, Andrew Jones, and became his Senior Sous Chef at Artisan. Bennett went on to compete in the Scholarship himself and was placed in the top six. His European education continued with a Head Chef position at London’s top rated pub, The Gun Docklands, and through various stages at London’s The Waterside and the world-famous Noma Restaurant in Copenhagen, which was rated the fifth-best restaurant in the world at the time. His most recent role was with one of England’s most-celebrated chefs, Nigel Haworth, as Senior Sous Chef at the Michelin-starred Northcote Restaurant, where he took part in the restaurant’s world-famous Obsession food festival. Bennett’s cooking philosophy remains simple: Less is more. Throughout his European training he has worked with the very best ingredients and techniques. 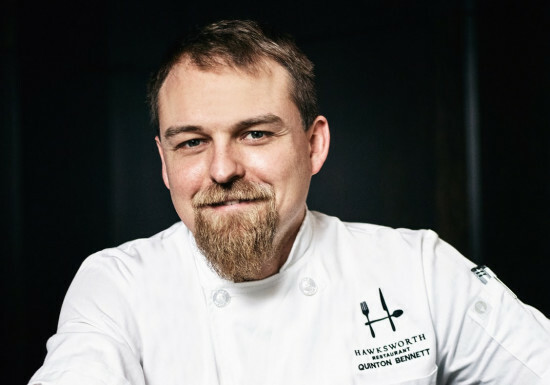 Now, with a focus on what our rich and diverse region has to offer, and using only the freshest of produce and local fare, he hopes to solidify Canada’s place on the culinary world stage, starting with Hawksworth Restaurant.